Went to see Hot Club of Cowtown again on Oct 4, 2011, this time at Club Passim. We first saw them at the Lowell Folk Festival in 2010 on a hot, sweaty summer day and jumped on the chance to see them again in this setting. Club Passim is a great venue for music – the sound is almost always really good and people are there to listen. I think it might be my favorite place in the Boston area to hear live music. If you are not familiar with them, there’s always youtube! They are very engaging performers and you should definitely check them out! They easily move from classic western swing (Sweet Jenny Lee?) to fiddle tune breakdowns (Orange Blossom Special!) to jazz swing (Limehouse Blues). Everyone gets a solo turn and they mix it up between the ballads (Someone to Watch over Me) and burning down the house instrumentals (Acorn Hill Breakdown). They really look like they are having fun on stage; and what’s not to like?? On August 21, 2011, the whole family, boys included, went to see Bob Dylan at the House of Blues in Boston, in the shadow of Fenway Park. I had to get tickets through stubhub for more than face value, let’s just say, because even though I had looked on ticketmaster/livenation the minute tix were available to the public, none were. I have a brief rant about that, too – Dear Livenation.com, if the concert is sold out, don’t make me search for tickets only to find out there are none left. The concert started at 8 and since HOB is one of those places where you have to stand, I wanted to make sure we got a decent spot when the doors opened at 7 pm. Lucas and I got dropped off early and got in line. Apparently, you could pay another $10 to get in the OTHER LINE, which meant you could go before the plebes in the real line. What a rip-off. We were about 10 people back in the line, and I already paid enough! Money buys access, no surprise there. One stressful part was that I had forgotten to bring the tickets with me when we got dropped off, so I was sweating bullets until Emily and Zach showed up. Once the doors opened, the process was fairly orderly and we got a standing spot about 15 people back or so. Other than the standing around part, it was all good. The crowd was a mix of old and young. They were enthusiastic, but not obnoxious. Typical of a Boston crowd, there were some folks who tried to move in on our space, but we put up a good blocking strategy, at least until the concert started. Then the short woman in back of us asked if she could move ahead so she could see and I let her. As to the music, the band was tight and Dylan looked to be in a good mood. His singing, if you call it that, was not so good. I describe it as a Miles Davis rap. You can get an idea by watching this video from the concert that someone posted on youtube. I didn’t even know what song he was playing until the chorus! It sounded worse out front, too. The concert was well worth going to, however, but certainly the first thing you notice is how the voice had gotten worse. The band was killer! I think the 2 guitarists each had guitar techs with them. They were constantly changing instruments. In addition to the guitars, there was a multi-instrumentalist who switched among steel guitar, fiddle, mandolin, and who knows what else. 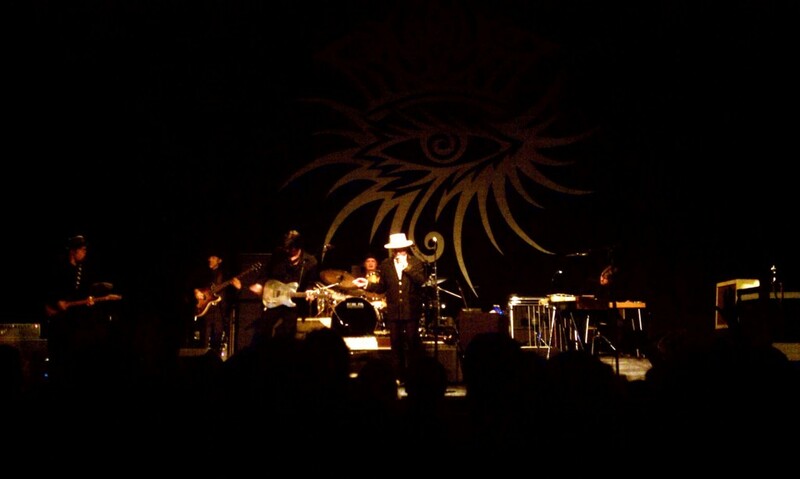 Bob himself played some electric guitar (with some mighty fine solos) as well as the ‘cheesy’ organ and harmonica. 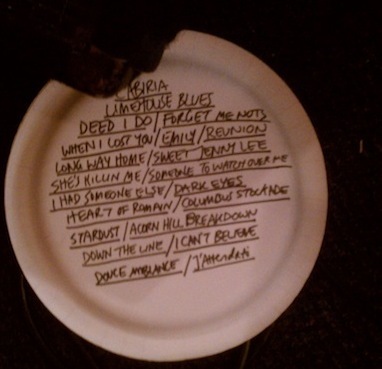 Here’s the set list, courtesy of Harold Lepidus. There’s a bunch of videos of the concert on youtube, all illegally shot, but who cares? Check it out and buy his music. 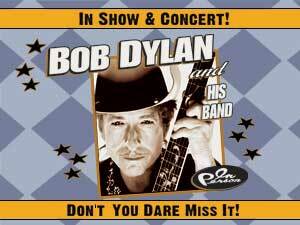 The last time I saw Bob Dylan (I think) was in 1976 in Fort Collins, CO from which the album “Hard Rain” was recorded. Let me tell you, it was not a good time being outside in the rain and mud. This was much better!